Colombian Fernando Gaviria gave Etixx-QuickStep its second victory in two days at the Tour de San Luis, convincingly winning the bunch sprint at the end of stage two in Villa Mercedes on Tuesday. Peter Sagan (Tinkoff) placed second, with Elia Viviani (Italy) in third. Last year’s Tour de San Luis acted as a breakthrough event for Gaviria as he memorably took two stage victories ahead of Mark Cavendish, leading him to be signed by Etixx a month later. After Monday’s team time trial win for Etixx, 21-year-old Gaviria takes the overall race lead from team-mate Maximiliano Richeze, who slips to second place at 10 seconds. The day’s escape group consisted of Juan Curuchet (Argentina), Ariel Sivori (Los Matanceros), Emiliano Ibarra (Sindicato de Empleados Publicos de San Juan), Israel Nuño (Inteja-MMR Dominican Cycling Team), Genki Yamamoto (Nippo-Vini Fantini) and Caio Godoy Ormenese (Brazil). Sivori led the action into the summit of the day’s only climb after 18km, cresting it first to claim the King of the Mountains points and the KOM jersey. Curuchet subsequently took the following intermediate sprint points at Fraga and Villa Mercedes at the half-way point. The break worked well together, building up a lead of over five minutes by the 100km-to-go point. Despite the attentions of Etixx-QuickStep at the head of the peloton behind, the gap slowly increased to six minutes with 30km to go. As the escape group dwindled to just Godoy, Sivori and Yamamoto, their advantage tumbled to 2-30 as the lead trio hit the 10km-to-go marker. The effort was starting to show as the three riders rocked in their saddles through the streets of Villa Mercedes, and they were caught in the final kilometre. Gaviria opened up his sprint early in the straight run-in to the finish, but instead of being chased down, he simply opened up more fresh air between himself and his rivals to freewheel over the line with his arms aloft. 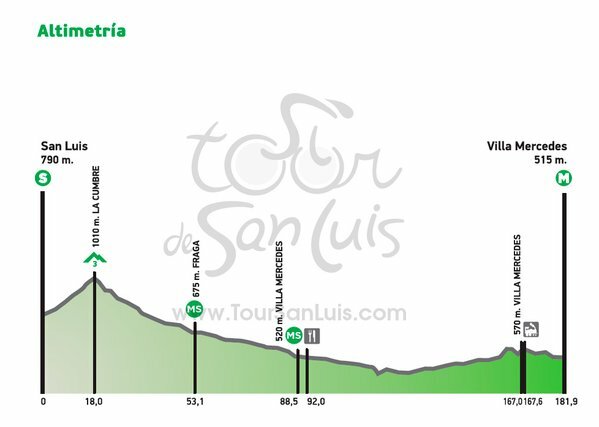 The 2016 Tour de San Luis continues on Wednesday with stage three from Potrero de Los Funes to La Punta. A relatively short distance of 131km and a flat profile suggest another bunch sprint finish, and another opportunity for Gaviria. The race concludes on Sunday, January 24.